single seat car that VW is working on would get 250+ mpg, top speed 75 mph. 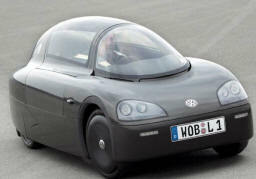 It can travel over 400 miles on its 1.7 gallon fuel tank! burned to make electricity -- its an honest 250 mpg -- amazing. Said to be ready to go on sale in Shanghai in 2010. $600US got to be a mistake! I doubt we'll ever see it in North America....especially after the billions bailout of the domestic auto industry. If protectionism doesn't kill it, it would be years before the government would certify it for the road. The other down side would be driving this with all the idiots driving gas-guzzling SUVs on the road (oops! except for the idiot part, that could be me ;-)) I'm not sure how safe I'd feel in a carbon-fibre shell. But $600....what a candidate for conversion to electric, as well!